4 October 2010 - As the world awaits Queen Elizabeth, Cunard Line announces today that Cunarders and cruise enthusiasts will be able to experience the grand celebration of its newest liner, all at the click of a mouse. Cunard and Cruise Critic - one of the most visited online cruise resources - developed a dedicated Queen Elizabeth web page that will feature multimedia content from the Royal Naming Ceremony, including a special highlights video exclusively from Cunard. Visitors to the dedicated page will also have the opportunity for a chance to win a luxury cruise vacation aboard the new liner. Queen Elizabeth is the second largest Cunarder ever built and joins her sister ship Queen Victoria and flagship Queen Mary 2 as the youngest fleet at sea. Her Majesty The Queen will name the newest Cunard ship in a ceremony that will take place on 11 October 2010 in Southampton, England. Visitors to the dedicated web page will be able to view the grand celebration and intimately experience the newest Queen as videos on her progress and extraordinary features will be available on the web page, along with special highlights footage from the naming ceremony, which will be available following the launch. to provide Cunard fans worldwide with special access to this historic Cunard and cruise industry milestone," said Peter Shanks, president of Cunard Line. Beyond exploring all the grandeur Queen Elizabeth has to offer, U.S. visitors to the dedicated web page can enter for a chance to win a luxury cruise vacation aboard the elegant new liner through Cunard's Queen Elizabeth Grand Celebration Sweepstakes. The Grand Prize is a five-day roundtrip Southampton England Getaway voyage for two on board Queen Elizabeth. 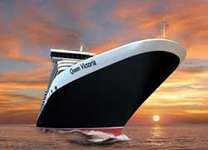 The sweepstakes runs until 18 October and is available on www.cunard.com/QEGrandSweepstakes. One grand prize will be awarded by random drawing by the end of October. Queen Elizabeth will feature many unique Cunard traditions linking her with her sisters and their predecessors, together with all the modern-day luxuries Cunard's guests have come to expect. There also will be features that will give the vessel her own style and personality. From the outside, her distinctive black and red livery will hint at an experience that differentiates a Cunard liner from a modern-day cruise ship. This will be most evident in the ship's adherence to liner traditions, with elegant double- and triple-height public rooms on a grand scale, luxuriously endowed with rich wood paneling, intricate mosaics, hand-woven carpets, gleaming chandeliers and cool marbles. Art Deco features will pay homage to the original Queen Elizabeth, reflecting The New Golden Age of Ocean Travel. Fans and cruise enthusiasts are invited to bookmark the Cruise Critic Queen Elizabeth web page now in order to return on 11 October to view the special highlights video. View Cunard Line Cruise Specials Here!